A filly that looks every bit a classics type. From one of the hottest stallions in Australasia (and HK) this filly is a lovely moving type who covers the ground well. She has both speed and stamina through her pedigree making her an ideal candidate for the 3yo Fillies Classics. 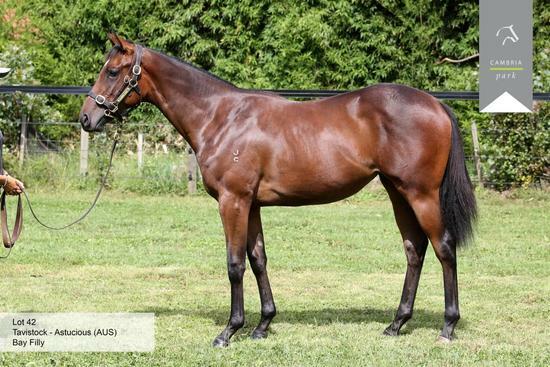 Lot 42 - Tav x Astucious - NZ Premier Sale Final PDS from Dalziel Racing on Vimeo. ASTUCIOUS, by Tiger Hill. Winner at 1400m, 4th Wellington S., Gr.3. Half-sister to SUTOLOGY, Baha, Eclair Classic - Ocean Fantasy (Mal. ), Myladys. This is her second foal. Her first foal is a 2YO. Chaparral Star. Winner at 1400m in 2017-18, HKJC To Fung Shan H., 3d HKJC Beijing Clubhouse Griffin S.
Baha (Bahhare). 6 wins from 1400m to 2400m, NZ$48,150, A$100,830, AJC Convention Centre H., Waikato RC NZI Insurance H., 2d ARC Cornwall H., L, STC 3com H., 3d Waikato RC New Zealand Bloodstock H., AJC Luskin Star H., STC Red Rock Deli H., Rosehill Event Centre H., Waikato RC Anexa H.
Rock Mylady. 5 wins from 1200m to 1600m, A$145,025, to 2017-18, ATC Pro-Ride H., Liverpool City Council H., 2d ATC Schweppes H., 3d ATC Michelle Dunn H.
Time Bomb. 5 wins from 1600m to 2000m to 2017-18, Taranaki RC Devon Hotel H., 2d Taranaki RC Epic Journeys H., 3d WRC Angus Inn H., Taranaki RC ITM PSP Tufclad Ultra H., Seaton Park H., Wanganui JC Spooner, Hood & Redpath H.
Minoa. 5 wins from 1800m to 2250m, A$103,000, QTC 97.3 FM H., Qld Tatt's RC Sky Channel H., BTC Nuturf H., Oscar Oscar P., 2d QTC Marist College Ashgrove Old Boys Association H., Even Stevens H., BTC Lexus RX330 P., Sky Channel H., Ekka H., Mitre 10 Mega Beenleigh H., 3d QTC Red Bull H., BTC Welcome to Greenwood Lake H.
The Pink Panzer. 3 wins to 1300m, SAJC Perks Chartered Accountants H., 2d SAJC Your Rights at Work H., 3d SAJC Magic Millions H.
Tiebreaker. 7 wins to 1400m, NZ$77,199, to 2016-17, Taranaki RC Coca Cola Dash H., 3d CJC Dunstan Feeds Autumn Sprint Championship Qualifier. BRIDIE JO (Exploding Prospect). 6 wins at 1400m, 1600m, CJC Canterbury Breeders' S.H., L, Cromwell Cup, Otago RC Hector & Alice Anderton Memorial H., Sumac Lodge H., 3d CJC Halls Refrigerated Transport H. Producer. Perspicacious (Sound Reason). 7 wins. See above.